In recent years, Roger has enjoyed short holiday breaks with his sister Silvia (two years younger) as well as regular holidays with his wife Vee. After three-day weekends in Paris (2006) and Sarajevo (2007), this year the third trip for brother and sister was longer (six nights) and further (the three Baltic states). For Roger, this holiday brought the total number of countries visited to 52. 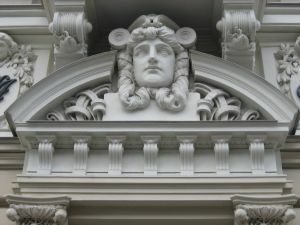 The Baltic states – from north to south: Estonia, Latvia and Lithuania – have long, complicated and different histories. Ethnically Latvians and Lithuanians are closely related, while Estonians have different origins and linguistically are related to the Finnish. Politically, Estonia and Latvia have had more in common, being subject to foreign rule from the 13th-20th century, while Lithuania has been a powerful empire in its own right especially in the period of the 14th-16th centuries. 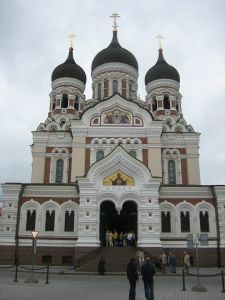 Most Estonians and Latvians are Lutheran, while most Lithuanians are Catholic (the Russian minorities in each country are Orthodox). However, in the last century, the experience of the three nations has been very similar. All three gained their independence in 1918 and had first republics which increasingly lapsed into totalitarian regimes of the Right as Nazism grew in Germany. In each case, as a result of the Ribbentrop-Molotov Treaty of 1939, the USSR assumed control of the country and took occupation of it. Nazi Germany invaded the USSR and occupied all the Baltic States in 1941 and retained control for three years until expelled by Soviet forces in 1944. Another 57 years of Communist repression only ended with independence again in September 1991. All three states joined the European Union in May 2004. So we were visiting the Baltics 17 years after the three member states regained their independence – a period of great change in the political, economic and social lives of the Estonians, Latvians, and Lithuanians. The particular week of our trip was one of heightened political sensitivity, since the day before our flight Russian forces had invaded the break-away Georgian enclave of South Ossetia. The subsequent statement by the Russian President Dmitry Medvedev, that the country reserves the right to defend Russian citizens wherever they live, unnerved many in Estonia, Latvia and Lithuania since all these independent states have Russian populations. 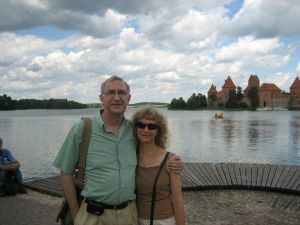 Our holiday was booked with the company Travel Editions [click here] and the group was 29 in all – many teachers, a lot of scientists and technologists, at least three Johns, and most in their 60s and 70s. 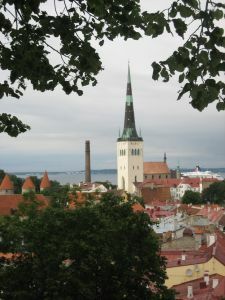 Travelling from north to south, Estonia is the first – and the smallest - of the three Baltic states. Some 70% of the country comprises forest. There are two large islands and other smaller ones. In a 'golden age', Estonia was once part of Sweden. Today Estonia has a population of only 1.4 million. They tend to be reserved and private people, not given to physical demonstrations of affection. Some 65% are ethnically Estonian, while 32% are Russian. 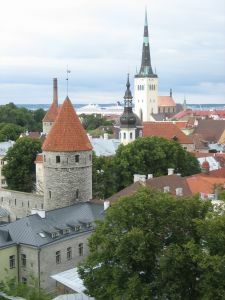 A large number of the Russian-speaking industrial workers brought into the country in the 1970s have ended up without Estonian citizenship for which they are required to pass an Estonian-language test. This is largely by choice since they wish to retain Russian citizenship. About a tenth of the population has no citizenship of any kind. Those without Estonian citizenship are not allowed to vote in elections but otherwise they enjoy the same rights as other citizens. Politically Estonia has had a troubled independence with a succession of different administrations. Already less than 50% of Estonians vote in national elections. The country has substantially embraced the Internet becoming something of a world leader in the on-line delivery of public information and services. All members of parliament have laptops and the parliament largely manages without paper documents. Voters can cast their ballot through the Internet and about 20% of those voting do so in this way. Parking charges are paid by mobile and next year voting will be possible by mobile too. Most bus tickets are purchased on-line and most tax declarations are made on-line. Estonia has enjoyed strong economic growth since joining the EU. Most citizens, however, have poor living standards because of low incomes and high inflation. The average monthly salary before tax is only around 14,000 Estonian crowns (around £700), while a typical monthly pension is a mere 4,000 crowns (about £200). Since the flight from London Gatwick was early on Saturday morning, Roger & Silvia spent the previous night at the Sofitel Hotel at the airport and rose at 6 am. The flight was with Estonian Air who do not provide meals as part of the ticket price but we had a cooked breakfast before leaving. It was a two and a half our flight and Estonia is two hours ahead of British time, so we arrived at Tallinn - located on the northern coast of the country - at the local time of 2.20 pm. We were met by our guide Riina Altpere. Apparently normally people on this holiday are accompanied from Gatwick and throughout the trip by a British guide with local guides providing more detailed information in each capital or site. In fact, for some reason, we did not have a British guide and our Estonian guide Riina accompanied through all three Baltic states. Actually this worked out very well because Riina spoke excellent English, was extremely knowledgeable and communicative, and was both personable and humorous. 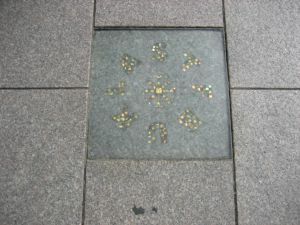 The experience of her family members caught something of the history of the nation: her paternal grandfather was an Estonian army officer who was sent to Siberia in 1939 and never returned, while her maternal grandfather was a fisherman who like all other fishermen suffered the cutting up of his boat by the Soviets so that there was no possible escape to Finland. We arrived in the country to overcast and gloomy weather, but Riina told us there is a local expression that “An Estonian summer is three months of bad skiing weather” - not much consolation since we were not planning on any skiing. The drive into Tallinn did not take long. This is not a large capital – some 400,000 people (actually around a third of the national population). However, some 400 cruise ships and 4 million tourists a year are currently visiting the city. The city was badly damaged by Soviet bombers (piloted by female crew) on the night of 9 March 1944, but much of the historic Old Town has been carefully restored. As we approached the city centre, on the north side of the Old Town, we saw our first sight: St Olaf's Church. Its main claim to fame is that, when its 159-metre high spire was completed around 1500, it was the tallest building in the world (following fires and reconstruction, is is now only 124 metres). Our hotel was Grand Hotel Tallinn and, after a mere three-quarters of an hour to check into our rooms and have a quick snack, Riina took us on a walking tour of the Old Town from 4.30-6.45 pm. 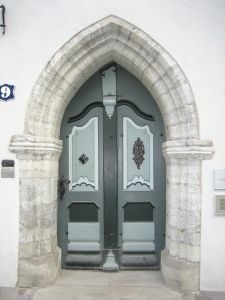 It was a charming place characterised by cobbled streets and pastel-coloured buildings with some strikingly attractive doors. Castle Square has two splendid buildings facing one another. 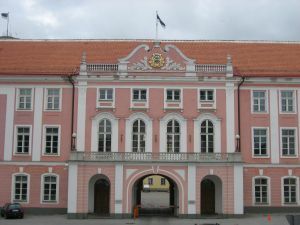 On the west side, is the Toompea Castle with its white and pink baroque façade dating from the 18th century when Catherine the Great had the structure rebuilt. 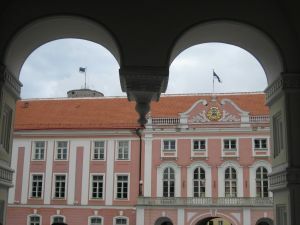 Today it houses the Estonian Parliament which has 101 members representing (currently) five political parties. Facing the parliament, on the east side of the square is the Russian Orthodox Alexander Nevsky Cathedral with its distinctive onion domes. This was built in 1900 as part of the general wave of Russification. 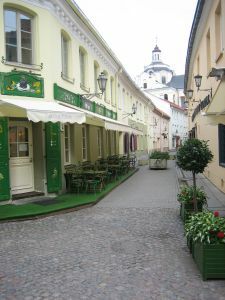 Round the corner is the Lutheran Dome Church. This was constructed in wood in 1219 and reconstructed in stone between 1229-1240. The church has a 17th century organ with 6,900 pipes and someone happened to be playing it during our visit which gave a magical atmosphere to our short time there. Walking past Stenbock House [click here] - the home of the Estonian Government - we were reminded of more recent and disturbing history, since the building wall carries a plaque remembering the Government officials murdered by the Soviets in 1941-1942. One of the other impressive churches of the city which we viewed externally is St Nicholas Church which is Orthodox and in its present form dates from 1822-1827. Our walking tour concluded in the heart of the Old Town: the large, pedestrianised Town Hall Square. Naturally the dominant building is the Town Hall itself, the only intact Gothic town hall in northern Europe reconstructed in 1402-1404. Apparently one can climb 115 steps for good views of the city. Other historic buildings line the square including the Town Council Pharmacy, said to be the the world's oldest continuously running pharmacy (it has been there since at least 1422). The square and the surrounding streets are full of cafés and restaurants and, once the tour was completed, we all split up and headed for our own choice of location for a much-desired dinner. Roger & Silvia found themselves in a place called “Kuldse Notsu Kðrts” [click here] on Dunkri Street. 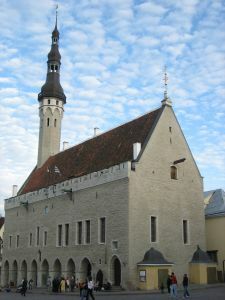 Located in the vaulted cellar of the St. Petersbourg Hotel, this is described as "an authentic Estonian country style restaurant” and Roger flung himself into the spirit by going for the most traditional dishes that he could find, short of actually venturing on to the quintessentially Estonian fare of blood sausages. 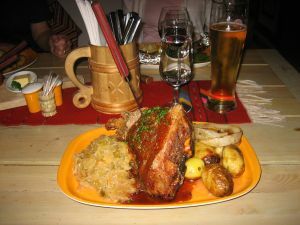 This meant that he started with the house speciality called Kuldse Notse which is a simply huge concoction of crisp pork knuckle with sauerkraut, baked potatoes and mustard. 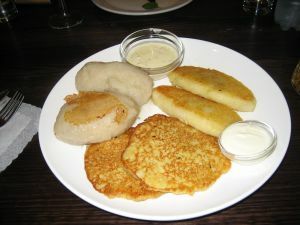 For dessert, he ordered something called Tuuliku Kama described as “an Estonian dish prepared from a mixture of rye, oat, barley and pea flour with clabbered [sic] milk” which turned out to look and taste like milky, cold porridge. Next day (Sunday) was devoted to a day trip out to Lahemaa National Park We left the hotel at 9.10 am and we were not back until 5.10 pm so it was a full day. The park is located due east of Tallinn and, on the way, we stopped first at the Tallinn Song Bowl which houses the national song festivals that have been held every five years since 1869 including the period of Soviet occupation. Some 30,000 can gather here and it is seen as a centre of national revival and identity. Lahemaa National Park (the name means 'land of bays') is 475 sq km of forested hinterland with a stretch of coastline along the Gulf of Finland that was heavily fortified in the Soviet period. It was opened in 1971 and was the first in the Soviet Union, its supporters winning the right to open it by finding some obscure references in Lenin's works to the idea of preserving one's countryside heritage. 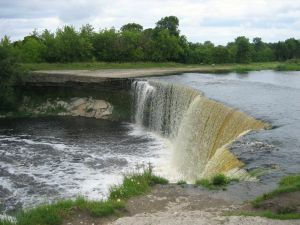 The park includes 14 lakes, eight rivers and four waterfalls. We stopped to view the Jagala Waterfall which is the country's largest and known as Estonia's Niagara Falls (in fact, its 7.2 metres hardly compares with Niagara 's 52 metres). A lovely feature of the park is its delightful villages and we were able to see four of them: Jöelähtme, Käsmu, Altja and Vergi respectively. We spent the most time looking at Käsmu which is known as the Captains' Village. The highlight of the day was a visit to the Palmse Manor House. 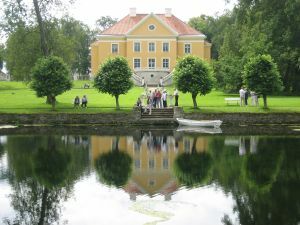 This was the private estate of the German Baltic family van der Pahlen from 1677 to 1923. It consists of some 20 buildings and a lake and surrounding land. The main building was built in 1785 and renovated in 1985 and we were given a tour of the principal rooms. Afterwards we had some lunch at the nearby “Palmse Tavern Kðrti”. 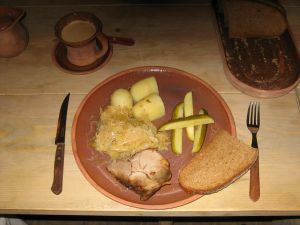 Given the size of the group, we were given no choice over what to have – all had what effectively is the national dish: pork, saukerkraut, potatoes and pickled gerkins. 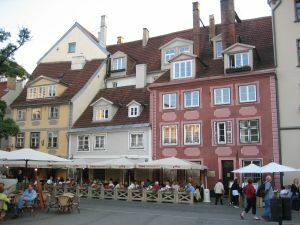 Back in Tallinn, Roger & Silvia returned to the Old Town for another dinner. This time we went for a medieval restaurant on the Town Hall Square called “Peppersack” [click here]. As a change from pork, we had fried salmon with wild rice. We missed the regular sword fight and the occasional belly dancing but you can view these on the restaurant's web site. Next day was Monday and it was time for a new country. So at 9.10 am we left Tallinn in Estonia and set off by coach southwards to Riga in Latvia. We broke the long journey in the south of Estonia at a seaside resort founded over 750 years ago called Pärnu with a local population of 43,000 that almost doubles in the summer. Did we say summer? In fact, we had rain and wind most of the three hours we spent there. So it was a case of coffee in a hotel, quick look at the beach, a stroll with umbrellas down the pedestrianised Ruutli Street with its statute of 19th century nationalist Johann Voldemar Jannsen, and then a light lunch in a café. Travelling from north to south, Latvia is the second of the three Baltic states – half as large again than Estonia but about the same size as Lithuania. Latvia has a population of only 2.3 million- more than Estonia but less than half that of Lithuania. Historically Latvia has had one of the highest rates of women to men in the world and many of the young women in Riga are simply beautiful (Silvia confirmed Roger's view). About a quarter of the population is Russian-speaking and the rights of this section of society have been a bitter issue since independence. Government reforms introduced in 2004 to restrict the use of the Russian language in schools remain controversial. Since independence, Latvia has had a series of unstable coalition governments. Economic growth has been strong but high inflation (currently 17%) remains a problem. 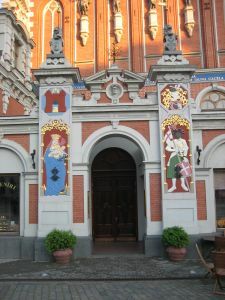 Latvian is something of an endangered language: only about 55% of the total population and just over 45% of the people of Riga speak it as their first language. After a rest stop at a service station just inside Latvia, we pressed on for the city of Riga , experiencing heavy rain for a while and then, as we approached the capital, hitting rush hour traffic. 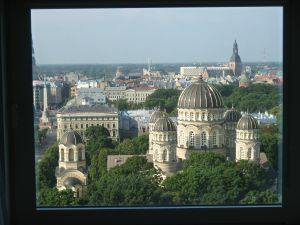 Riga is located in the north of Latvia, a few kilometres from the Gulf of Riga on the banks of the Daugava River. 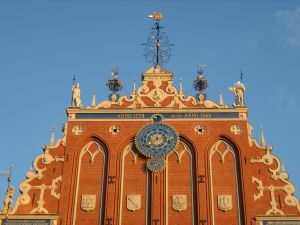 Founded by Germans in 1201, it is over 800 years old and the largest city in the Baltics. 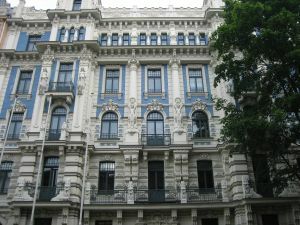 One third of the city centre is built in the art nouveau style. Today it has a population of about 790,000 which is around a third of the entire population of the country and almost twice the size of the other Baltic capitals Tallinn and Vilnius. 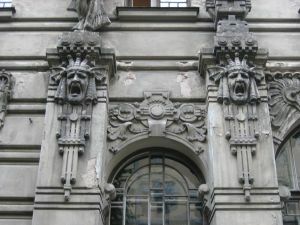 It was 5.15 pm (eight hours after we left Tallinn) when we reached our hotel in Riga: Reval Hotel Latvija [click here]. 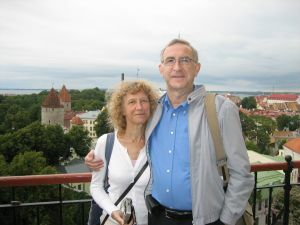 This is the largest hotel in the country and Roger & Silvia were accommodated on the 15th floor with a grand view over the Russian Orthodox Cathedral and towards the Old Town. The official programme for Riga did not begin until the morning, so we all had the evening free to do as we wished. Roger & Silvia first explored an open-air market in a park by the side of the Orthodox cathedral, buying some small handicrafts. Then we crossed the City Canal and entered the Old Town. Like that of Tallinn, this is full of cobbled streets and interesting old buildings, but the scale is larger and there are a lot of buildings in the art nouveau style. We counted ourself fortunate with our choice of location for dinner: the “Salve” restaurant [click here] located in “The Blue Troops House” on the Town Hall Square. This is a Latvian establishment with a warm ambience and excellent food. 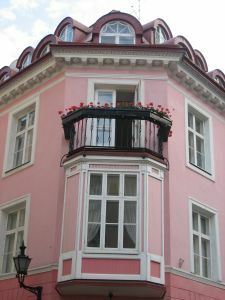 Tuesday morning consisted of a tour of Riga's Old Town with a local (Russian) guide called Jelena. She joked with us about the irregular pronunciation of English: “In English, you see Manchester and you pronounce Liverpool” - rather appropriate since Roger & Silvia are originally from Manchester and three of the others on the tour were from Liverpool. Sadly, however, she was an incredibly dogmatic woman. She told Roger – a huge film fan – that she translated the dialogue of American movies into Latvian and was currently working on “Jaws 3” and struggling with the translation of the phrase “Pull the pin!”. She had obviously looked up the word 'pin' in a dictionary and found that the colloquial meaning is 'leg' and insisted than her translation must refer to something about knocking a leg, even though Roger (supported by Silvia) told her that the phrase of dialogue probably referred to the use of a grenade [on checking, it does click here]. The short walk from our hotel to the Old Town takes one past the imposing Freedom Monument. 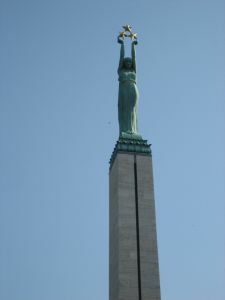 Built on the spot where a statue of Peter the Great once stood, this was erected in 1935 in a style best described as 1930s nationalism, topped by a female Liberty holding three bronze stars representing the three regions of Latvia. Slightly disturbing was that the monument has an official guard of honour from 9 am to 6 pm and the two soldiers march extremely slowly with no bending of the knee which is just a little too reminiscent of the goose-step. Jelena showed us some of the more distinctive sights of the Old Town where one could spend days exploring the little lanes and decorative buildings. 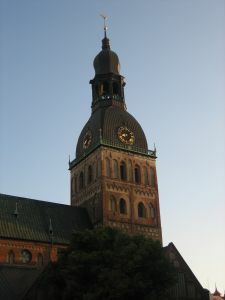 There was the 1330 Powder Tower, the only remaining example of what was once 28 towers which used to ring the city, the Parliament (Saeima), housed in a Florentine renaissance building, St Jacob's Cathedral, a Catholic place of worship originally constructed in 1225, the Three Brothers, a set of three old buildings which includes one dating from the 15th century (making it the oldest house in Latvia), and the Dome Cathedral, founded in 1211 and the largest church in the Baltics. 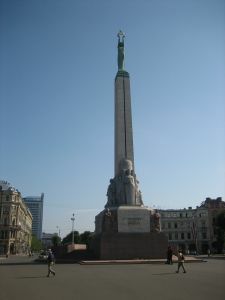 The tour concluded in the Latvia Riflemen Square (otherwise known as the Town Hall Square) dominated by the Latvian Riflemen Statue. The said marksmen were eight regiments formed in the First World War to fight in the Russian imperial army who, following the October revolution, mostly supported the Bolsheviks and became Lenin's palace guard – a reminder of the country's complicated history. On opposite sides of the square are two very new buildings, First there is the Town Hall which was only built in 2002 (Jelena encouraged us to use its toilets so that the place offered some value for its cost). Then there is the oddly-named but beautiful House of Blackheads [click here]. Originally constructed in 1334, this was destroyed by the Soviets in 1941 and reconstructed in its original form in 1999. The building's name has nothing to do with skin imperfections. Instead the Blackheads was the name for a union of young, unmarried merchants and ship captains who used to meet in the building. They chose St. Maurice - an imaginary African black moor – to be their patron. By mid afternoon, it was raining but – like the true Brits that they are – Roger & Silvia had umbrellas and kept going, determined to see as much as possible of the city. We left the Old Town and wandered around a park centred on the City Canal. The iron bridges over the canal were festooned with metal locks inscribed with the names of lovers and the dates that they were locked in place – how romantic (but what happens if you fall out of love and cannot find the key?). Next we looked inside the Russian Orthodox Cathedral which was built between 1876 and 1884 and in Soviet times was turned into a planetarium and a café. 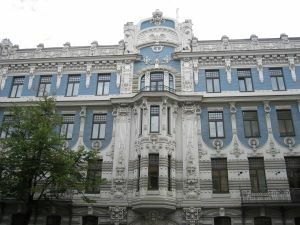 Finally we made the walk over to an area known particularly for its art nouveau buildings [click here], centred on two streets called Elizabetes and Alberta - some designed by the architect Sergei Eisenstein, the father of the famous Russian film director. 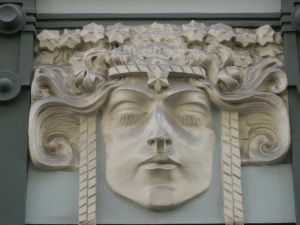 This style – known locally at the time as Jugendstil – is beautiful and we saw some striking buildings but, to be honest, one can see better examples of art nouveau architecture in Prague. In the course of our art nouveau walking tour, we needed to sit down and have a drink and accidently came across a place called “Goija” located between Elizabetes and Alberta Streets on a road called Stelnieku. It was dark inside and it took us some time to take in everything. Then we could not decide whether we had wandered into a north African den or travelled back in time to a 1960s psychedelia experience or simply become part of the set of the film “Eyes Wide Shut”. “Goija” turned out to be an exclusive Morocco style tea club where visitors can enjoy Chinese, Japanese, Indian or Moroccan teas (about 50 kinds in total), while relaxing on the sofas in a quiet and peaceful atmosphere and listening to new age music and taking in the smell of candles and joss sticks. Dozens of illuminated tea specimens can be examined through magnifying glasses at the counter. The cafe is non-smoking but there is a separate lounge at the back for water pipe smokers that resembles a 19th-century opium den. Once they had come to terms with it all, Roger & Silvia ordered Chinese white tea, adding boiling water to the leaves and then pouring the tea into tiny cups. Just as we were getting used to all this mysticism, two unbelievably attractive young women sat down next to us: one dark-haired with a tight cotton grey skirt, the other blond with the shortest of black mini-skirts. Truly this was ”Eyes Wide Shut” for real. Roger sat there in awe while Silvia had a fit of the giggles. After a quick refreshment call on our hotel, we went out for another evening meal in Riga's Old Town. This time we choose a place called “1739 restaurant” located in a historic 18th-century house near St Peter's Church. Although Roger had already eaten a lot of pork on the trip, he decided to go the whole hog (sorry for the pun) and have another such meal but this time a Russian dish: pork stuffed with prunes. It was Wednesday and time to leave Riga but, on the way from Riga in Latvia to Vilnius in Lithuania, we were going to visit a palace in Latvia. Our coach left the hotel at 8.45 am and once more it was raining. Travelling almost due south on the E77 road, it took us almost an hour and half to reach Rundale Palace [click here]. 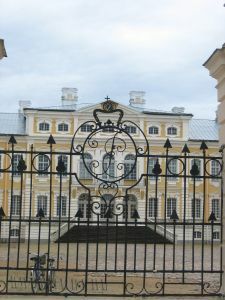 This baroque structure was built between 1736-1740 as a summer residence for Baron Ernst Johann von Bühren (1690-1772) and designed by the Russian court architect the Italian Francesco Bartolomeo Rastrelli. Most of the interior decorations were created between 1765-1768. 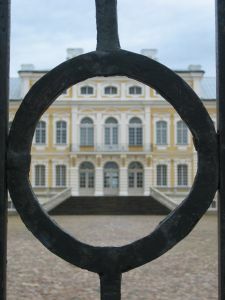 The Shuvalov family owned the estate until 1920 when the new Latvian government introduced the agrarian reform and, as a result, the palace became the property of the Republic of Latvia. After the First World War, there were flats and an elementary school in the damaged palace. 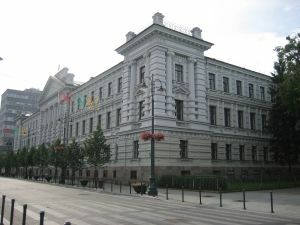 In 1933 the palace was taken over by the State Museum of History and some repairs were carried out. The palace did not suffer damage during the Second World War but, after the war, some of its rooms were adapted for a granary. 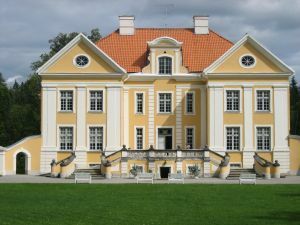 In 1972 ,the Rundale Palace Museum was founded and restoration of the palace began and is still going on. 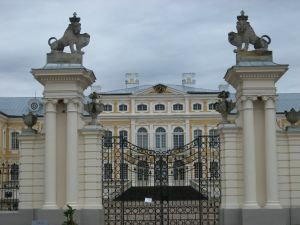 The palace has a total of 138 rooms and currently about 40 are open to the public. We were given a guided tour of just over one hour by a middle-aged women who had spent years at the palace as a master restorer. This included the Gold Room (which was the throne room) and the White Room (which was the ball room). After a coffee and a cake (and in Silvia's case answering an oral survey for the Latvian tourist authorities), the group reboarded the coach and set off southwards for the Lithuanian border. 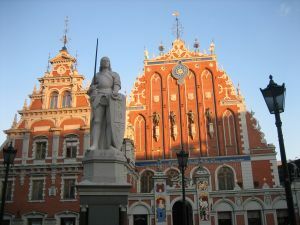 Travelling from north to south, Lithuania is the third of the three Baltic states. It is the same geographical size as Latvia (and therefore half as large again as Estonia) but, with a population of 3.4 million, it is the biggest of the Baltics, with one million more citizens that Latvia and two million more than Estonia. However, Lithuania has does not have as serious a problem of ethnic Russians as its Baltic neighbours since the proportion of Russians in the country is merely 7%. 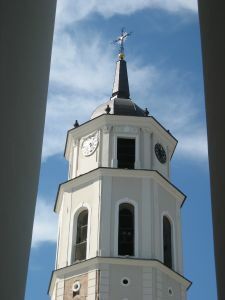 Whereas the majority religion in Estonia and Latvia is Lutheran, in Lithuania some 80% of the population is Catholic. Lithuania is the oldest state of the Baltic countries, being proclaimed a kingdom by the pope in 1251 and it was once part of an extensive empire with Poland sharing kings with its neighbour for two centuries. In the Second World War, its Jewish population suffered terribly. At the start of the war, the country had some 240,000 Jews; by the end of the war, the number was a mere 5,000. Since independence, Lithuania has had a new government on average almost once a year: 14 in 17 years. However, the country has embraced market reform and, in the run up to and period following EU entry, it saw very strong economic growth. It applied to join the Euro zone but was rejected because the inflation rate was too high. The Lithuanian language is very important to linguistic scholars, since it is said to be as archaic as Sanskrit in its grammatical forms. Less than half an hour after leaving Rundale Palace, we crossed from Latvia into Lithuania without any formalities whatsoever. 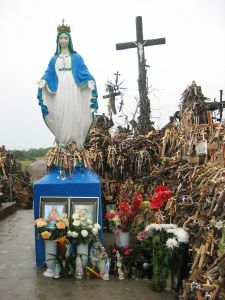 A further three-quarter of an hour southwards, we stopped to observe a feature known as the Hill of Crosses located near the city of Siauliai. This is an amazing place, possibly given even more mystery by the lashing rain. 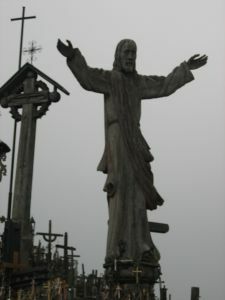 On a low hill and described as the 'Mecca of Lithuania', devotional crucifixes bristle from the tombstones. We were told that there were some 50,000 crosses but it is impossible to imagine anyone being able to count them. They come in all forms: wooden and metal, large and small, plain and ornate, cheap and expensive. It is said that crosses have been here since the 14th century but there are many different explanations for the origin of the practice. Certainly the placing of crosses here has been going on for at least a couple of hundred years and continued throughout the Soviet period. 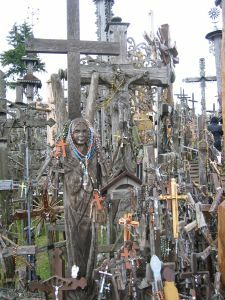 How one reacts to viewing the Hill of Crosses probably depends very much on one's own religious beliefs. If you are a practising Christian, you may well find it a very moving, even emotional, experience. If you are a secular person (like Roger & Silvia), you might find it strangely disturbing. One of our group said that it brought to mind scenes from the film “The Exorcist”. Soon afterwards we made a refreshment break at a service area where the main eating room had glass cases holding a snake and terrapin respectively. Then we headed south-east through the rain to the capital city of Vilnius where we saw no less than four accidents on the approach road to the city and eventually arrived at 6.40 pm, some 10 hours after we had left our hotel in Riga. Vilnius has a somewhat different position in Lithuania compared to that of Tallinn in relation to Estonia or that of Riga in relation to Latvia. Whereas the other Baltic capitals house around one third of their country's population, Vilnius has only 555,000 out of a total population of 3.4 million (16%). Before the Second World War, the city had a very sizable Jewish population of almost 100,000 in a community dating back to the early 14th century which gave it the name 'the Jerusalem of the North'; today there are a mere 4,000 Jews in the city. 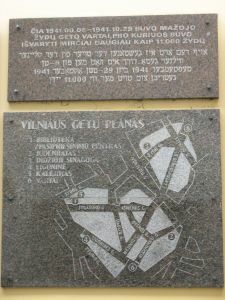 In fact, before the war, Vilnius was not only not the capital of Lithuania – it was not even in Lithuania (between the world wars, it was in Poland). In the inter-war years, effectively Kaunas was the capital and much earlier Trakai was the capital. Actually we were staying in Vilnius in what had been the Jewish Quarter and our accommodation was the Hotel Conti [click here]. As in Riga, we had a free evening before a tour of the city in the morning. 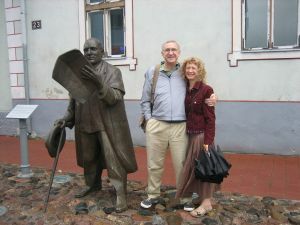 Roger & Silvia walked down to the Old Town where Pilies Street is full of cafés, restaurants, hotels and souvenir shops. Here we had dinner in the “Aula” restaurant which is located in the vaulted medieval premises of Vilnius University. Roger & Silvia decided to taste an authentically Lithuanian dish and therefore shared something called cepelinai (sometimes called zeppelin [click here]. This is a kind of dumpling made with grated potatoes and we were served with three types ranging from the quite tasty to the glutinously awful. 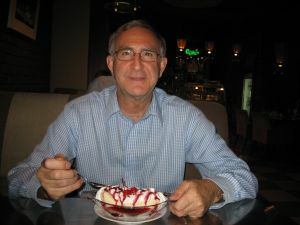 After this we felt the need to find a “Double Coffee” place to finish off, so Roger was able to have a delicious banana split and Silvia enjoyed a hot chocolate drink. Thursday morning dawned and it turned out to be a sunny day – the best of the trip. At 9 am, we were introduced to our local guide Irena – an English teacher – who took us on a two and a half hour walking tour of the Old Town which including lots of churches. 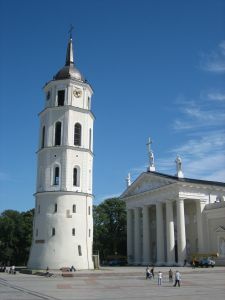 All Saints Church dates from 1631 and was a folklore museum during the Soviet occupation; the Gate of Dawn dates back to 1514 and now houses a chapel with the Renaissance painting of the “Holy Mother Mary, Mother of Compassion”; the Church of the Holy Spirit is the main Orthodox church in Lithuania. Now, in a group of 29 walking through small streets and squares, Roger & Silvia were not always together and, at this point, Roger realised that he had lost Silvia. In fact, she had entered the chapel above the Gate of Dawn, thinking that the group was going to see the picture of the Madonna, when all we had done was stand in front of the gate, listen to our guide, and then move on to the Orthodox church. By the time Roger and Riina realised that Silvia was not with the group and backtracked to find her, she had been 'lost' for almost half an hour. The tour moved on to the Town Hall Square, where a huge electronic screen was showing the Olympics in Beijing, and then to the former location of the Jewish Quarter. 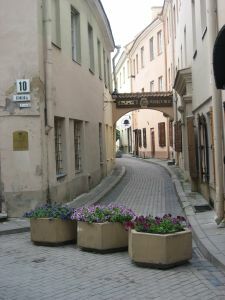 When the Germans occupied Vilnius, the Jewish Quarter was turned into two ghettos. The 11,000 occupants of the small ghetto were liquidated after 46 days in Paneriai Forest outside the city. The large ghetto survived until 1943 when another 26,000 were killed at Paneriai and a further 10,000 sent to the concentration camps. Today all that there is in the former ghettos to mark this element of the Holocaust are two wall plaques in what was the small and large ghettos respectively. The tour continued with a stop outside the Presidential Palace before we looked inside the courtyards of the University of Vilnius (established by Jesuits in 1579) and the Church of St John founded in 1387 and containing open confessional booths. We finished in Cathedral Square, most of which is pedestrianised. 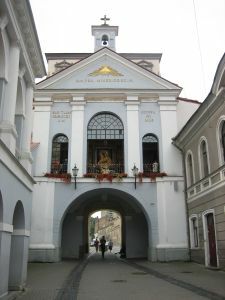 This includes Vilnius Cathedral, which started as a wooden structure in 1387 and served as picture gallery in Soviet times, the 57 metre Bell Tower which stands at the western end of the cathedral, the equestrian statue of Gediminas who ruled the Grand Duchy of Lithuania for 25 years at the beginning of the 14th century, and the so-called 'magic' tile (stebuklas in Lithuanian) which marks the end of the human chain of two million people which stretched from Tallinn to Vilnius on 23 August 1989 in a call for independence for the Baltic States. At the end of the interesting walking tour, we were given time to go off individually and have lunch – Roger & Silvia found another place on Pilies Street. We reconvened in Cathedral Square, where a newly married couple were having photographs shot, before at 1.10 pm boarding a coach for Trakai [for account, see next section]. We returned to Vilnius for 5.30 pm. After a rest in our hotel, Roger & Silvia returned to Pilies Street for dinner. This time we chose an Argentinian restaurant called “El Gaucho Sano” which is part of the Atrium Hotel [click here].Roger enjoyed a grilled beef sirloin - a change from all that pork – and for dessert both Roger & Silvia tucked into pancakes covered in a rich caramel sauce called dulce de leche. 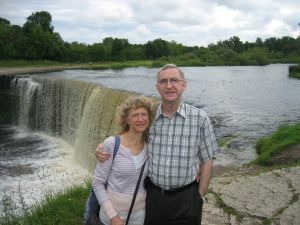 Friday morning in Vilnius was free time and Roger & Silvia had a personal programme and were determined to make a reasonably early start, so at 9 am we set off on our own tour – but it did not turn out at all as we had planned. Close to our hotel, we found the only remaining synagogue in Vilnius which was built in 1894 and only survived because the Nazis used it as a medical store – but it was not open until 10 am and we had a programme to fulfill. Next we found the Jewish State Museum [click here] - but it was closed for the day. Then we located the Holocaust Museum (the Green House) which is hidden away – but it too was closed for the day. So we moved on to the Museum of Genocide Victims [click here] located in the former KGB headquarters – but (you've guessed it) it was closed all day as well. So, what was going on? 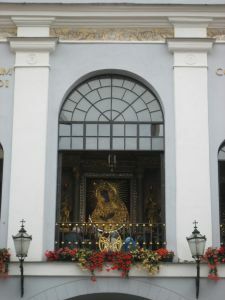 It was the Feast of the Assumption of the Blessed Virgin and, in very Catholic Lithuania, all public buildings were closed. So we decided to walk out to the Hill of Three Crosses (you can't close a hill, can you?) but we missed a key turning (there was no signage) and had no time left to resume the search. This was all a reminder of why Roger & Vee usually go on organised holidays – the local guides know what to see, how to get there, and when it is open. 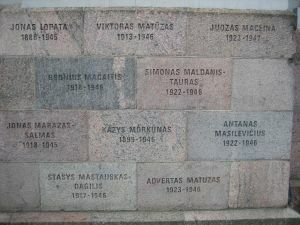 In fact, the walk to the buildings marking the victims of the Nazis and the Soviets raised a difficult question – just how much do the Lithuanians today remember and mark the two occupations and repressions? Whereas the Holocaust Museum was quite difficult to find and located in a simple wooden hut, the Genocide Museum is well-signed, its walls are marked with the names of KGB victims, and the building is surrounded by several memorials. 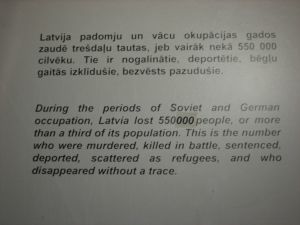 The number of deaths as a result of 48 years of Soviet occupation was 74,500, while the number killed in the three years of Nazi occupation was 240,000 including around 200,000 Jews. So it was just time for one more visit to “Double Coffee” for a quick lunch before we returned to the hotel for our coach to Vilnius airport. 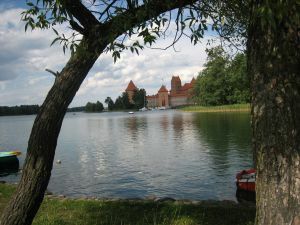 Thursday afternoon was spent on a coach trip to visit Trakai [click here] which is located 28 km west of Vilnius and built around three major lakes. Gediminas probably made this his capital in the 1320s and Kestutis certainly based his 14th century court here. It only took us 40 minutes to drive there but, thanks to city traffic, it took us 75 minutes to return to our hotel. 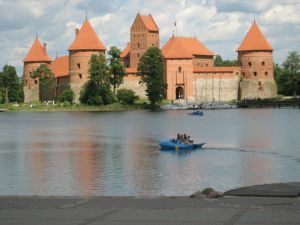 The Island Castle on Lake Galve probably dates from around 1400 when Vytautas needed stronger defences. Only about one-third of the structures were still standing by the the 1950s and reconstruction commenced in the 1960s. Today it is is the only insular castle in Eastern Europe - a red-brick fairy-tale castle that attracts newly-married brides from Vilnius for picturesque photographs. We had a guided tour of the various galleries and halls, some of which house exhibits from Trakai History Museum. In just seven days, we had seen three different countries and experienced three different capitals and learned about what the Baltic states have in common and what makes each distinctive. Tallinn in Estonia, Riga in Latvia and Vilnius in Lithuania each has an attractive Old Town with cobbled streets and historic buildings, with Riga being the largest and most vibrant. It was a delight to see the Estonians, Latvians and Lithuanians enjoying their independence once more after such a short-lived first experience (1918-1940) and after three periods of occupation by two brutal regimes (1940-1991). But we understand the nervousness about these newly-won freedoms in the face of Russian aggression in Georgia during our holiday. We wish the Baltic people a free, secure and prosperous future. As well as being a most enjoyable holiday, it was probably quite a healthy one too. Roger was wearing his pedometer throughout the trip and he clocked up an average of almost 15,000 steps a day for the seven days which, since 10,000 a day is the target, was an achievement.